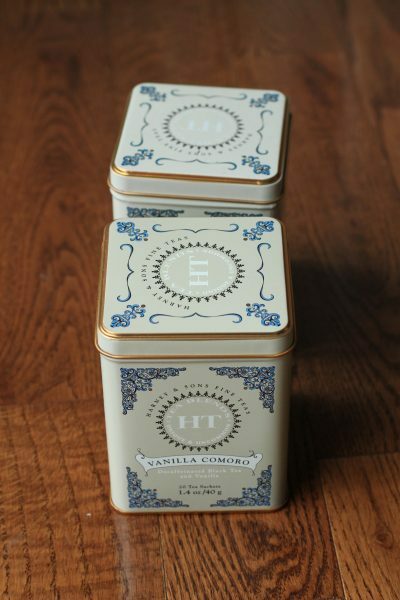 Though it’s not cheap, we are big fans of Harney and Sons vanilla comoro tea. I kind of hate to throw these tins away because they seem so reusable. 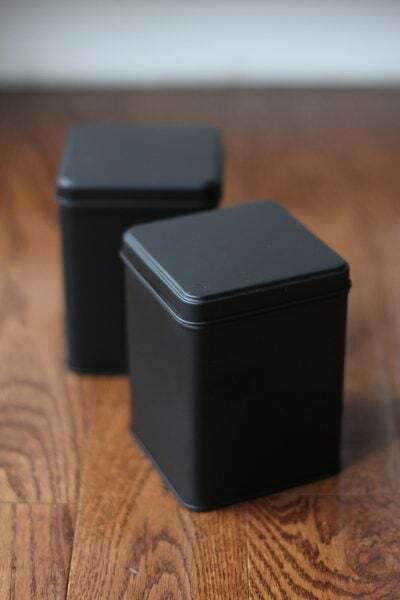 I thought they’d make great little gift tins, but they’re not quite suited for that as-is. So, I decided to paint them with chalkboard paint. I live with a bunch of artsy people, and I was pretty sure they’d enjoy having the chance to customize gift tins for recipients. I primed the tins first, using a gray spray primer. Covering the tins took several thin coats. Be patient with spray paint! Better to do multiple thin coats than one big gloppy coat. 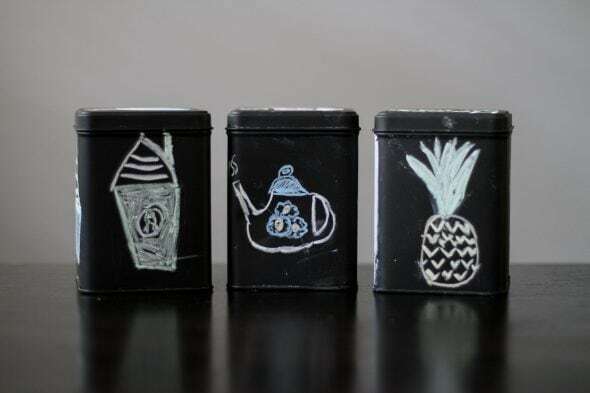 After the primer dried, I spray the tins with chalkboard paint (multiple coats again). I use Rust-Oleum chalkboard paint, which is less than $4 on Amazon. But you can also find this at craft stores like Michael’s, and you can use a 40% off coupon when you buy it, which makes it super affordable. Since chalkboard paint is porous, you’re supposed to season it first by coloring all over it with white chalk. This is supposed to fill in all the tiny holes so that the chalk doesn’t leave shadowing marks in the future. I must say, this method hasn’t offered a lot of help with chalk ink shadowing, but I think it does help with regular chalk shadowing. 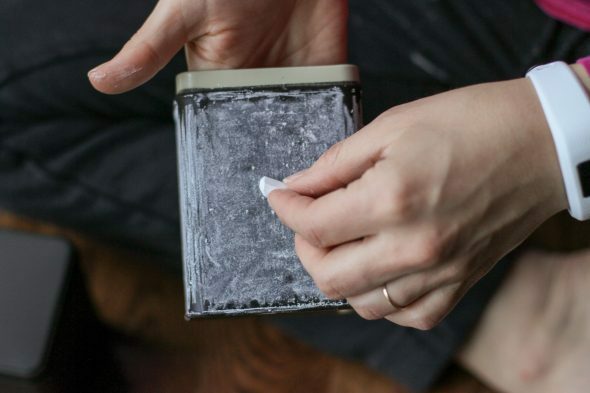 Once you’ve seasoned and wiped off the tin, it won’t be a perfect black anymore, but that’s ok. It’s chalkboard! It’s supposed to be a little cloudy. You don’t have to get super fancy with decorating these. 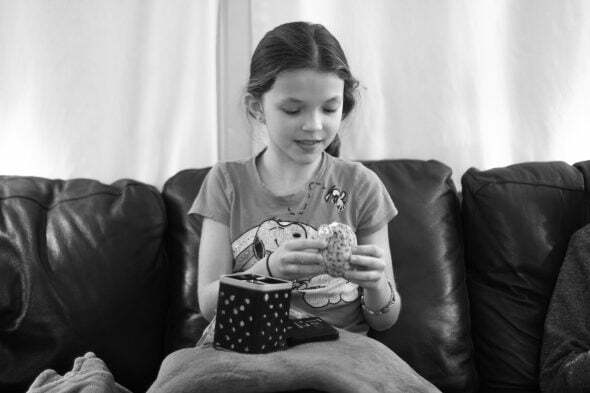 Here’s one Sonia decorated with dots to hold Zoe’s birthday gift. 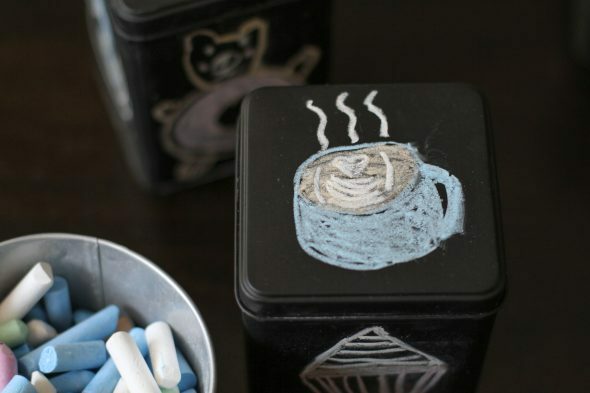 I’m not very good at drawing with chalk, but Sonia and Zoe put some art on the tins so I could take pictures for you guys. Chalk ink would be way easier to work with, but man, we have terrible trouble with chalk ink leaving shadowing on chalkboard paint. 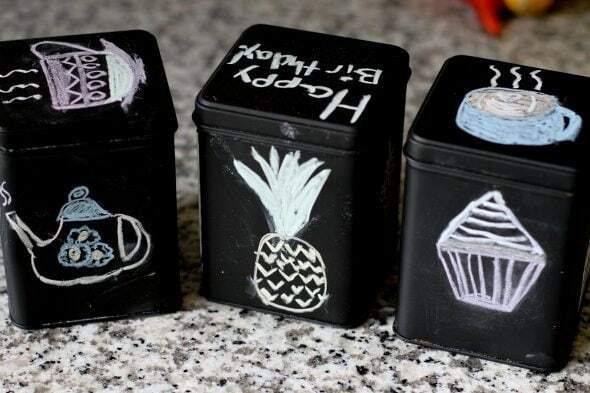 But, if you want to decorate the tins one time and them leave them that way forever, then chalk ink is a great option! My favorite is Zoe’s latte art drawing. So cute! We haven’t drawn on/wiped off these tins too many times yet, so the jury is still out on how well the chalkboard paint holds up. But if the tins need a little touch up, that’s no big deal…my can of chalkboard paint is still quite full even after multiple projects. « What I Spent, What We Ate | Oh geez. I love this idea and how they turned out! A tip for cleaning chalkboards is to use a cloth dipped in coffee. I write our chalkboard sign every day at work, and I have a tin of cheap instant coffee I use to clean it. Interesting! Does the coffee make the chalk come out better? Love this tea, love this idea. I’ve saved several of the tins, so I’m totally using this, thanks! Cute idea! These types of tins are regularly at Goodwill for a buck or so. 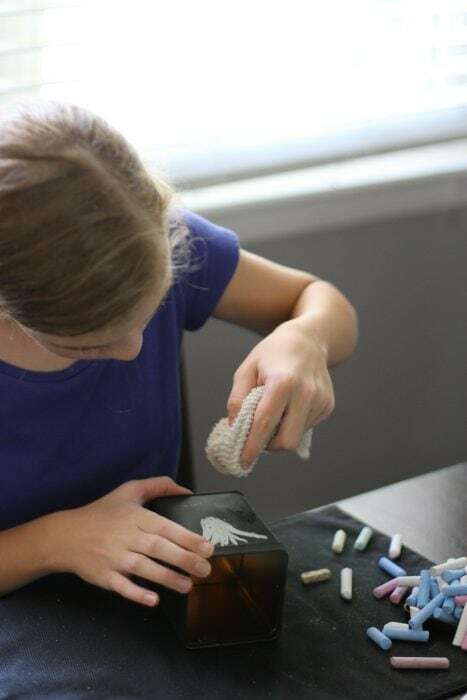 You could put a couple pieces of chalk in with your gift and the recipient gets two gifts in one! I love this! I always have the idea to do something like this but I never do. I never think to buy it in spray form! That would be so much easier. I’d love to know how it holds up with use! I have jars that I would like to do this to if it works out well! Chalkboard paint is fun stuff. I painted the lids of baby food jars and turned them into spice jars. It’s been quite the success for me. What a fun idea! I have a tin that I saved because it seemed a waste to just throw it out – now I know what to do with it! 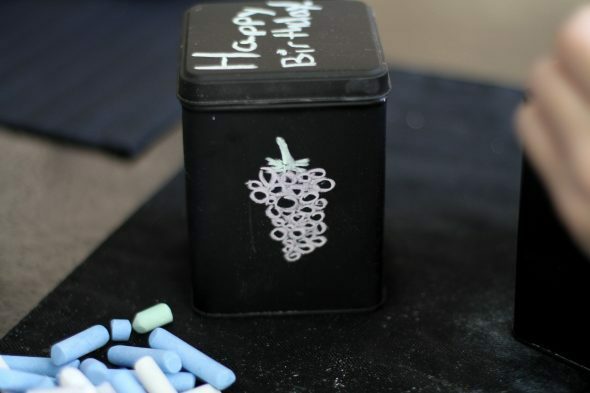 I used chalk markers on a magnetic chalk board which I bought and sadly the markers stained the chalk paint. I bought it with birthday money so it was a fun splurge that I am quite disappointed I ruined! I’m going to try the coffee trick above and see if that works. I had thought about painting it and I guess I didn’t realize chalk paint came in a spray can. So I just might give it another coat of chalk paint! Yes! Definitely spray paint it if the coffee trick doesn’t work. It’s super easy to do. The coffee didn’t work, though I did try it! What happened was the chalk paint pen permanently stained the chalkboard paint, because it’s paint I was writing on with paint, not a real chalk board…. I’m glad to know there is spray chalkboard paint! I’ll have to give that a whirl! They would! I’m wondering if the tin would rust. Maybe you could put a small pot inside the tin? 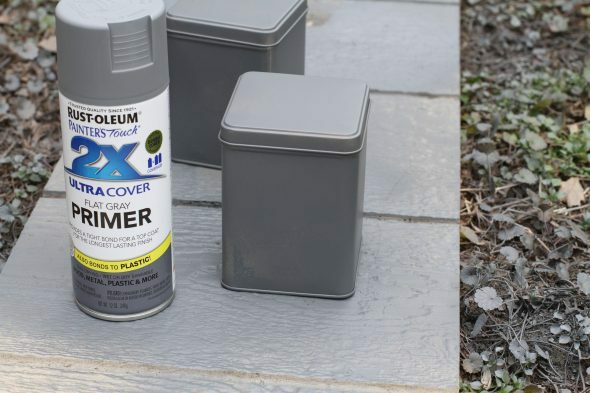 Or maybe if you spray painted the inside of the tin with regular paint, that would help keep the actual metal dry. I have planted cuttings in tin cans and when they rusted, the plants were not harmed at all…I just transplanted them when they outgrew it.. These are so precious! I love that the tins are so nice-looking and reusable. I wish more products would come in nice containers like those. Heck, I love how they looked just with the primer on them! Could be a great, frugal way to store sugar and flour in a pinch. I like the black primer too! So neat. 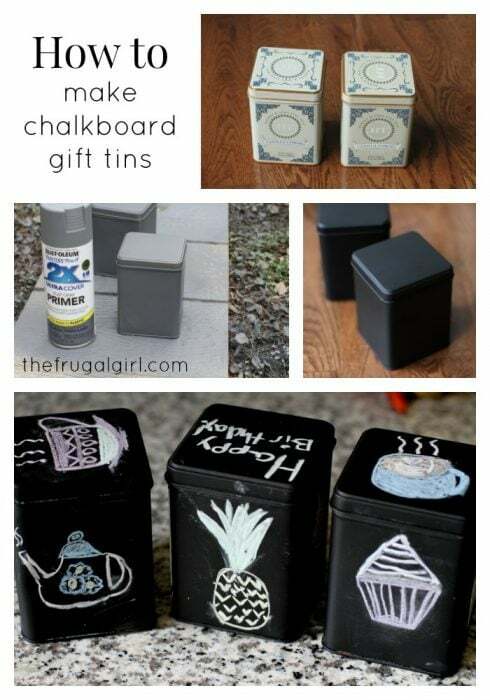 I love the chalkboard tins you made! We have a couple of old tins at home which we use to hold random things like coins, needles, and thread. This is another great use too. P.S. You are SO creative! 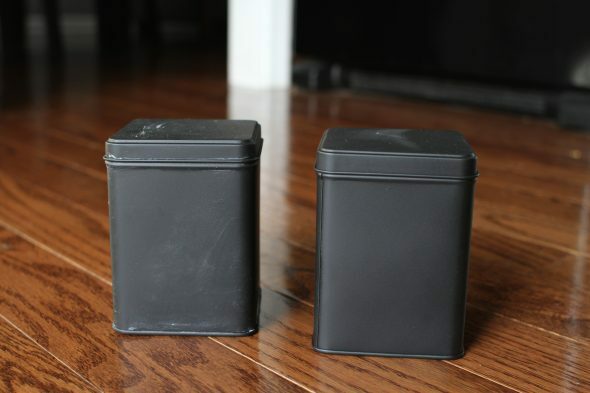 That’s a good idea too…these would make great storage containers for small stuff. And you could just use chalk to label the container. This is smart, and I love Battra92’s idea of doing jar lids to create spice jars, too. 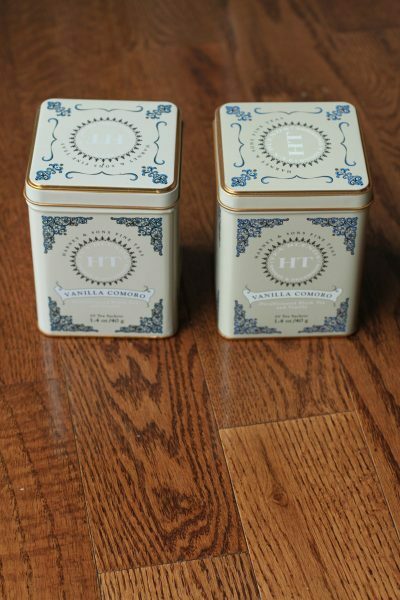 I have a few small Mark T. Wendell tea tins, and that’s a good way to use them, so thanks for the idea! FYI, harney and sons have a website. I get the vanilla Comoros tea sachets in a resealable bag of 50 and refill my tin from the pantry.